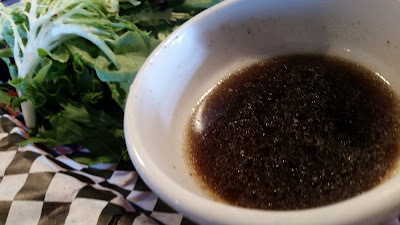 French Dip Reviews: 5 of 5 DeliciScore™ (From Heaven) Awarded to Georgetown Liquor Company for their Vegetarian Dip Sandwich in Seattle, WA on this 14th day of July, 2016 - The Picard - God, it's good! 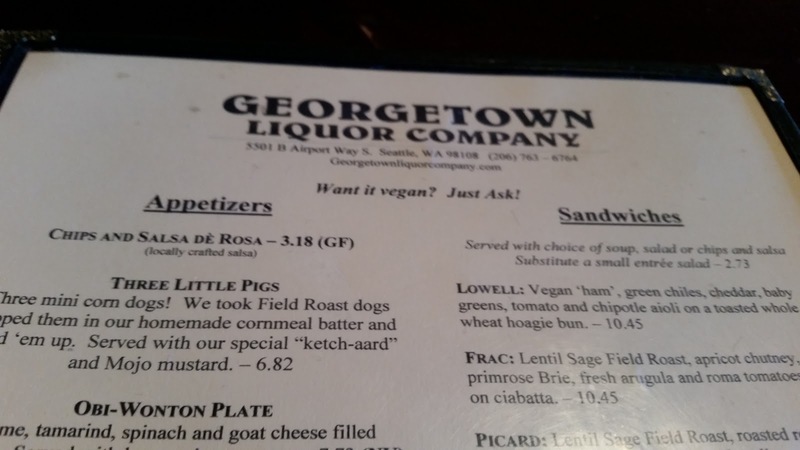 5 of 5 DeliciScore™ (From Heaven) Awarded to Georgetown Liquor Company for their Vegetarian Dip Sandwich in Seattle, WA on this 14th day of July, 2016 - The Picard - God, it's good! 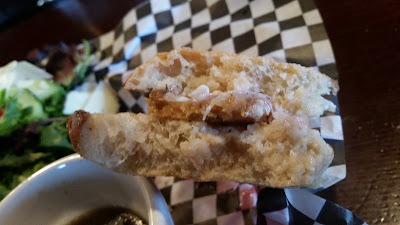 It was a Friday and I had the day off of work because I had been on call the previous weekend (see the Cowiche French Dip review from my trip to Yakima). It was a lazy and fun day and I didn't have much going on. 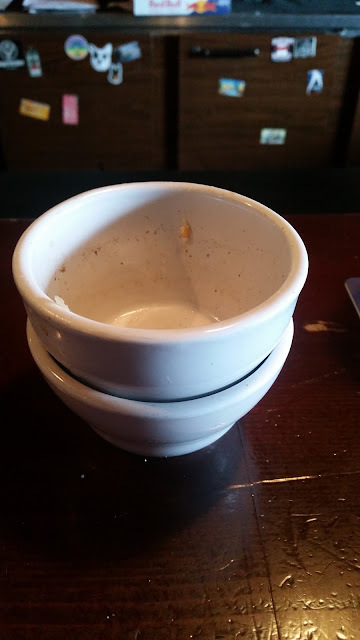 So I figured a French dip would be a good treat. So I looked on my French Dip To Do List on Foursquare for my next adventure and I found the Georgetown Liquor Piccard. I had been told about this French dip years ago by my old pal Charlotte who is a food stylist, foodie, cook, artist, etc. And I knew it was vegetarian but she said it was delicious so I knew I had to hit it up. 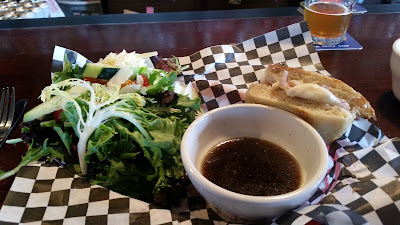 And I had not had a vegetarian French dip before so this was fascinating and exciting to me. I was intrigued. I showed up at Georgetown Liquor at lunchtime on a Friday and there weren't too many people there but I immediately liked the place. I sat at the bar and enjoyed the company of the bartender. A few others were there but it wasn't very crowded. So there's the Picard, "Lentil Sage Field Roast, roasted red onions, fresh mozzarella, creamy roasted garlic spread, toasted on ciabatta. 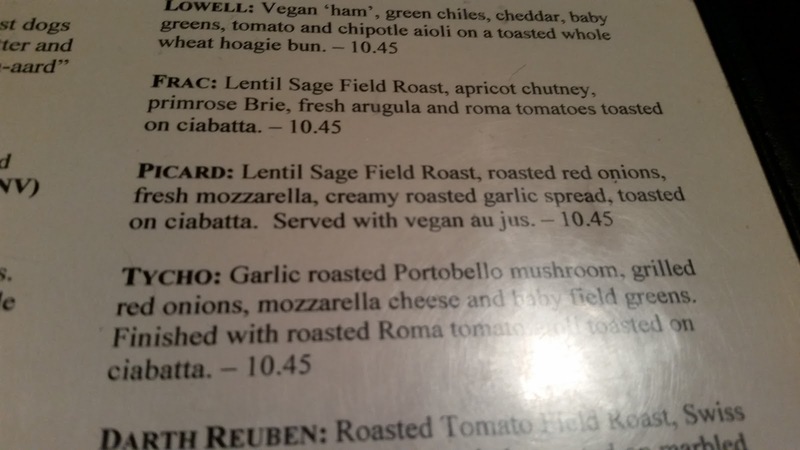 Served with vegan au jus. $10.45. Pretty intriguing, right? I was definitely intrigued. Here's the picture of the plate, served. The mozzarella is visible. The jus is dark. The salad is composed of nice greens. Again, dark and very good jus. And this salad, you will note, unfolded into a PLATEFUL of salad, which was a nice treat afterwards. I ordered the vegan ranch dressing (this place only serves vegetarian stuff, btw, if you hadn't picked up on that nuance yet). 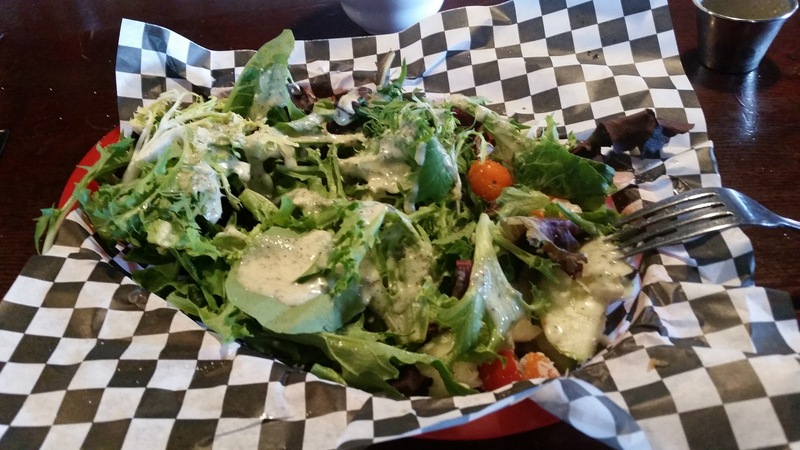 Not too impressive AND blurry image of the expanding salad that was so good. Note the shaved parm and chunky, skinned cukes! So I went through two au jus cups. Do you hate me? Limited jus - this is true but I asked for more and it came right out, piping hot, deliverd by the cook! Toasted - yep, good job. Gotta have it toasted. Great taste - Sure it was. Quality - Yep, it really was a tasty unit! The sandwich alone had no problems without the jus and was good alone, which is a great sign. But you have to dip of course. Great, peppery jus flavor - I "pre-tasted" the jus (sipped some) to gauge its caliber and was basically delighted. Didn't need or want beef/ meat - Yeah, the lentil safe Field Roast was extremely tasty and din't make me feel like I needed real beef. This is a true statement is that some of the meatless proteins can be soooooooooo good and delicious you'd really never need or want meet again. Until you have meat again and it's really good. Very satisfying and delicious - Yep, thank you Georgetown Liquor for an excellent sandwich. The barkeep said it is indeed their most popular and I can fully understand why. How great was this thing?!?! Smaller size not bothersome - Yeah, I'm over this. You wouldn't want to overdo it with immensity. Onions, basically delicious - Yep, I really enjoy delicious things, like the roasted red onions, it turns out. Field roast really tasty, almost meat like - Yep. Good stuff. Thank you. More jus promptly delivered by cook - That was a really nice touch and impressed me. 5 of 5 across the board. Delicious. God this was good. 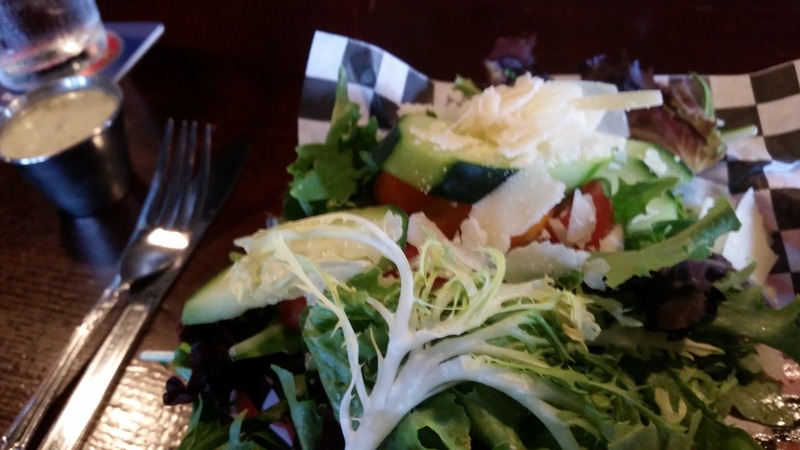 Served in a red plastic basket with checkered paper - Why not? "Meat": 4 of 5 - I love that it's not meat and so good. But it's not meat and can't beat excellent beef so I"m going to pull out the penalty flag here but an excellent use of delicious protein.